Speaker John Bercow has been accused of calling senior government minister Andrea Leadsom a “stupid woman” in the chamber of the Commons. 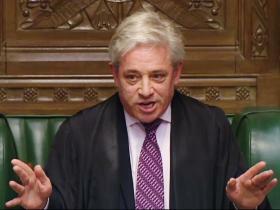 The remark allegedly came after prime minister’s questions on Wednesday when Mr Bercow berated the government bench for scheduling a statement on a opposition day debate – taking time away from Labour’s debate on the Grenfell Tower tragedy. According to the Daily Telegraph, he is said to have made the comments about Ms Leadsom, the leader of the House, who is responsible for taking care of Commons business on behalf of the government. The Commons leader was reported not to have heard the comment, but MPs who claimed to have caught his remarks were said to be outraged. The Speaker’s office acknowledged “strong and differing views” had been expressed in the chamber on what it said had been an “unusual and controversial day” in Parliament. However it insisted that Mr Bercow treated MPs with respect while seeking to facilitate the work of the House. The allegations will undoubtedly renew calls for his resignation, who faces accusations of bullying staff who previously worked for him – claims he denies. It also comes after an inquiry into allegations Mr Bercow bullied two former private secretaries, Angus Sinclair and Kate Emms, was blocked by MPs. The Commons Standards Committee voted three-two against allowing Parliament’s watchdog to investigate the allegations, which he has consistently denied. One unnamed MP who caught Mr Bercow’s aside told The Daily Telegraph: “He said ‘stupid woman’ and went on to say either ‘f****** useless or f****** outrageous, but I am clear that the words ‘stupid woman’ were said, and I am clear that the word ‘useless’ was said. In a statement, the Speaker’s Office told the Press Association: “Wednesday was an unusual and controversial day in how business was handled in the House by the Government and some strong and differing views were expressed on all sides on the subject. The Independent was unable to reach the Speaker’s Office.